Cranberries oh glorious cranberries! Hopefully you’re all making your own cranberry sauce from scratch this Thanksgiving. It’s easier than boiling an egg, you really can’t go wrong! Get my easy 10-minute recipe here. But the best thing about making your own cranberry sauce is having fresh cranberries on-hand. At Thanksgiving and Christmas, I love to stock up on tonnes of these little red jewels. I put them in muffins, cakes, and pies, but I especially love the vitamin C and antioxidant boost they give to my morning smoothie. 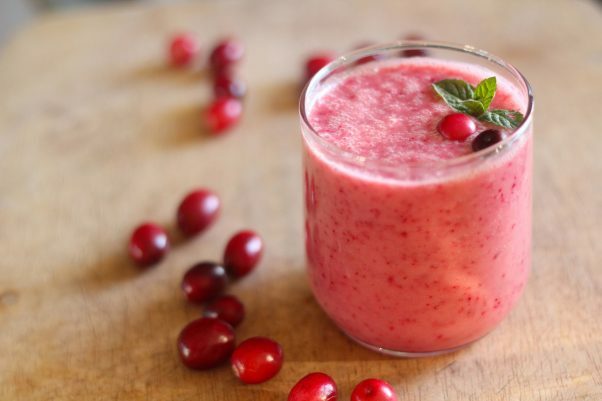 So be sure to buy an extra bag of fresh cranberries so you can make this marvelously nutritious and refreshing smoothie for the morning after turkey-day. Cranberries are one of the most antioxidant-packed berries around. In fact they are on par with acai berries! And since they are native to North America, they should be our number one choice when it comes to locally grown superfruits. The antioxidant compounds found in cranberries have been shown to fight cancer, aging, inflammation, diabetes, and bacterial infections. Wowzahs! And since you get the most benefits from eating them raw (as opposed to cooked or dried), adding them to smoothies is a healthy choice. 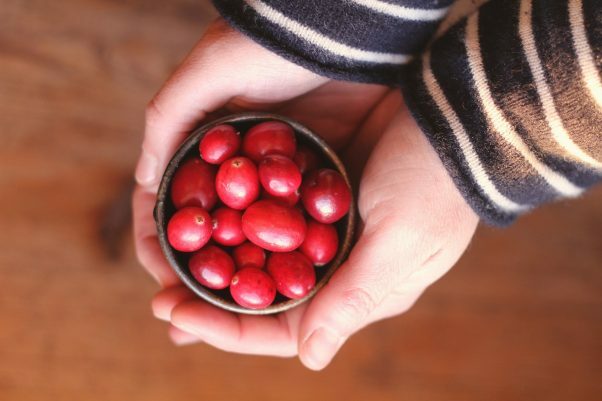 When shopping for cranberries, it is so important to buy organically-grown because there is a soup of toxic chemicals used in the cranberry farming industry, including known carcinogens and bee-killers. Not exactly a nice addition to Thanksgiving dinner. Last week, I attended an organic farming conference and was so excited to meet some local cranberry producers who switched to organic practices several years ago. You can read their inspiring story here. I immediately pounced on the biggest bag of cranberries they had and proudly came home with enough cranberries to last me until Christmas. Organic cranberries are not always easy to find where I live, nor are they easy to produce, so these ones are very precious to me. I love knowing that they were grown by a family who made the brave decision to switch to organic practices. Since they made the change, they have seen the native bee populations return to their farm. In my mind these people are true heroes. And since Thanksgiving is a time for gratitude, I give thanks to this family and the many people who work so hard to produce the food that is on our tables. I raise a cranberry smoothie-filled glass and toast them! Cranberries can be used for more than just your cranberry sauce this Thanksgiving. 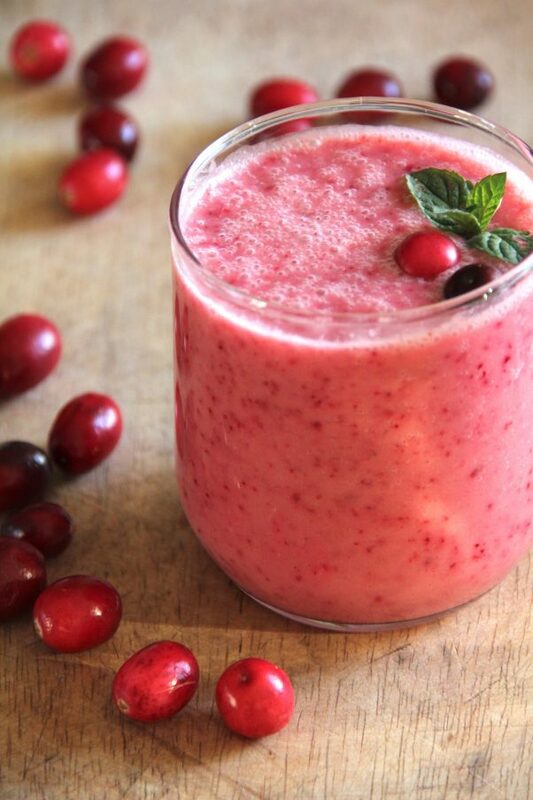 Learn how to make a cranberry smoothie from food blogger Aube Giroux of the Kitchen Vignettes blog. Place all ingredients in the blender and blend until smooth and uniform. Taste and add more cinnamon or maple syrup if you wish. Serve right away. 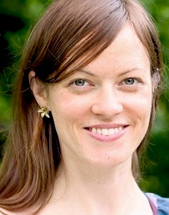 Aube Giroux is a food writer and filmmaker who shares her love of cooking on her farm-to-table blog, Kitchen Vignettes. Aube is a passionate organic gardener and home cook who likes to share the stories of how food gets to our dinner plates. Her work has been shown on television and at international film festivals. Her web series was nominated for a 2014 James Beard Award. In 2012, she was the recipient of Saveur Magazine’s Best Food Blog award in the video category.